TurboBiotinylase has a specific activity of >8,000 Units/µg. 1 mg/ml within 1 hour at 25℃. TurboBiotinylation Kit is shipped with gel packs. The kit retains its full activity after incubation at 25℃ for over a week. 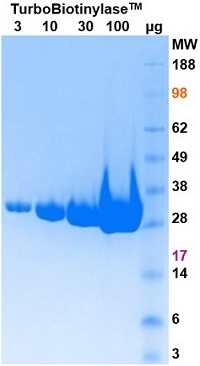 TurboBiotinylase at -80℃ and 10X TurboBiotinylation Mix at 4℃. 2 mM TCEP, 50% glycerol. weight of 35.6 kDa. It is free of protease or nuclease contamination. spectrometry. Biotinylation adds 226.31 Da to a protein. 3. 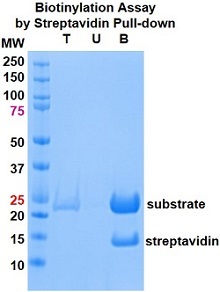 Incubate with streptavidin-agarose for 1 hour with agitation. 4. Spin down the streptavidin-agarose. 7. Run gel and stain with Coomassie Blue. 1. Warm the protein buffer, target protein, and 10X TurboBiotinylation Mix to 25℃ in a water-bath. • Target protein at 1-5 mg/ml. Adjust volume with protein buffer. 3. Mix gently and incubate at 25℃ in a water-bath without agitation for 2 hours. Do not dialyze the reaction. target proteins of different sizes (10-130 kDa) in most cases. needed for complete biotinylation of a target protein at 4℃. reaction at 25℃ and 10X TurboBiotinylase in a reaction at 4℃. 1 mg/ml target protein, 2X TurboBiotinylase for 2 mg/ml target protein, and so on.